Cornstarch Dog Treat Icing is a No Sugar Option, and it's Easy! 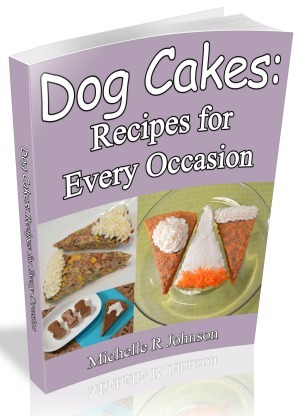 Cornstarch dog treat icing is another healthy alternative to traditional icing. It is similar to the egg paint recipe for dog treat frosting, in that you must apply it before you bake your dog cookies. Feel free to apply this dog biscuit icing any way you like. You can paint it on, or if you are decorating with kids, let them use their fingers for a messy good time. Combine cornstarch and water in a bowl with a whisk or fork. Add the desired amount of food coloring. See Tips below for suggested amount of water and food coloring. Two tablespoons of cornstarch are equivalent to a 1/8 cup of cornstarch. Use this for ease in preparation and so you only have to measure once. Cornstarch has a tendency to become lumpy when mixed with warm or hot water. So, only use cold water for this recipe. The cornstarch will begin to thicken if it sits too long. Just be prepared with a small fork nearby to mix it up. You may need to add more water if it gets too stiff. Do so very gradually, about 1 tsp. at a time. If you are going to be making several different colors, you can easily double or even triple this recipe. Mix the dry ingredients with the water and then separate into small dishes or bowls and color each one separately. The amount of water you add will vary. You want the consistency to be somewhat runny. I typically use about 1 Tbsp of cold water for 2 Tbsp of cornstarch. The amount of food coloring you use will be a personal choice and depend on the end color you are wanting to achieve. For the medium brightness colors in the picture above I used 5 drops for the blue and 6 drops for the green. You can also use a food coloring paste for this recipe. 2 TBSP rice or potato flour - great option for dogs with gluten or grain allergies. 2 TBSP plus 2 tsp tapioca, the quick cooking or instant variety. This is also a gluten free option. What's great about each of these options is that they are all white or very light in color. 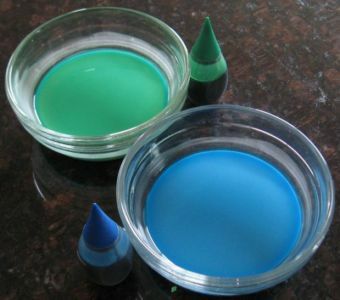 You want to use something that is neutral in color so you can get a more vibrant color from your food coloring. Whether you are decorating dog biscuits for a special occasion, a homemade dog gift or just for fun, try out this easy cornstarch dog treat icing recipe.